Add chicken breast and 1/4 cup water to a small casserole pan, cover loosely with foil and cook 45 minutes or until cooked through and juices run clear. Allow chicken to cool until it can be handled, remove skin and discard. Shred chicken with a fork. In a mixing bowl, combine shredded chicken and barbeque sauce. Place one tortilla on a medium nonstick skillet and turn to medium heat. 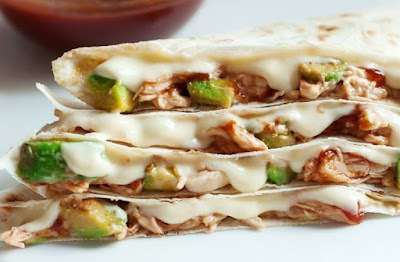 On one half of the tortilla, sprinkle with 1 heaping tablespoon mozzarella, add 1/6th of chicken barbeque mixture, 1/6th of diced avocado, sprinkle another heaping tablespoon cheese and fold the tortilla over. 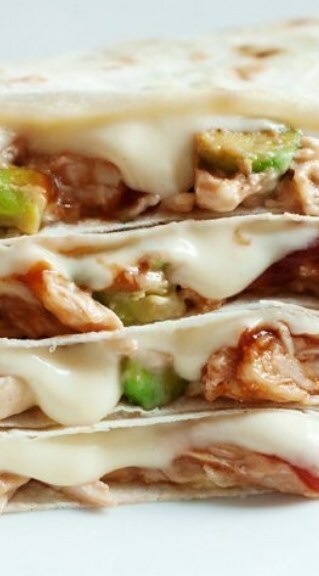 Cook on both sides for about 2 minutes or until the tortilla is golden brown and the cheese is melted.